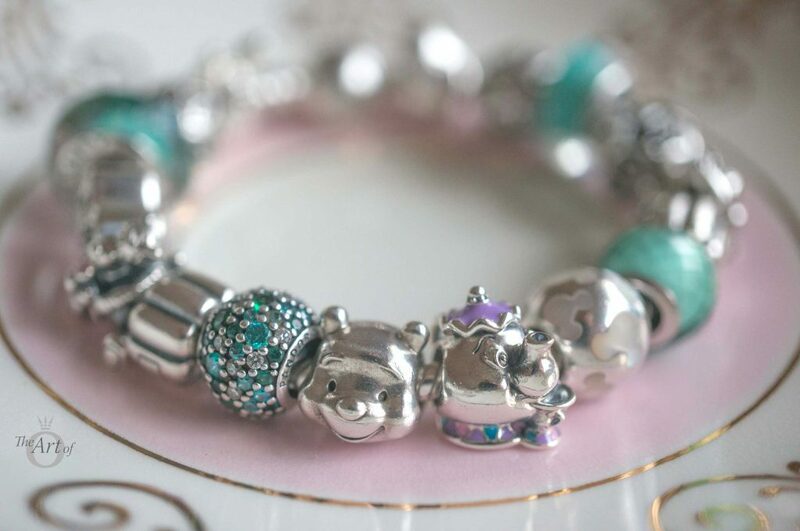 The motherly Mrs Potts and cheeky Chip will add a spot of colour, fun and most important of all, love, to your bracelet. 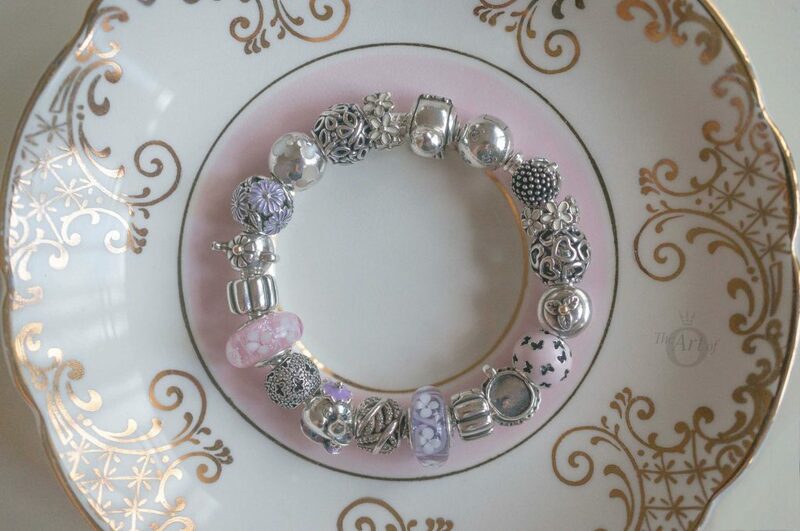 The PANDORA Disney Spring 2017 Collection was brimming full of beautiful charms. 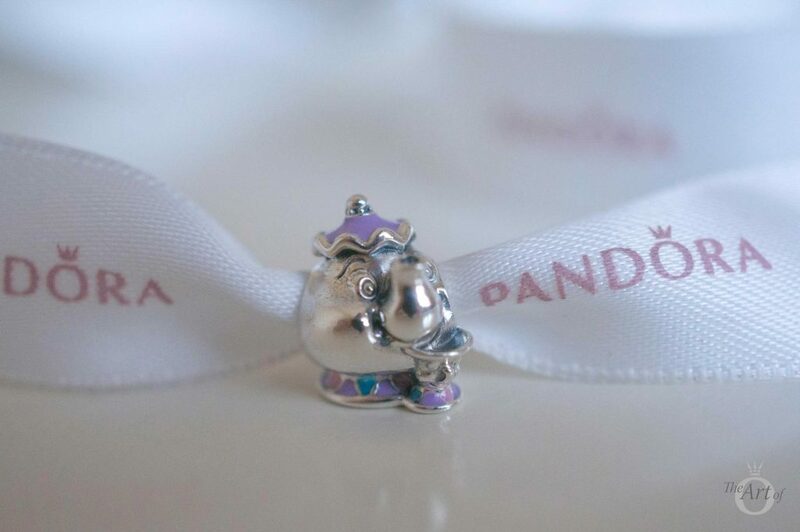 One of my favourites is the adorable Mrs Potts & Chip Charm (No. 792141ENMX). 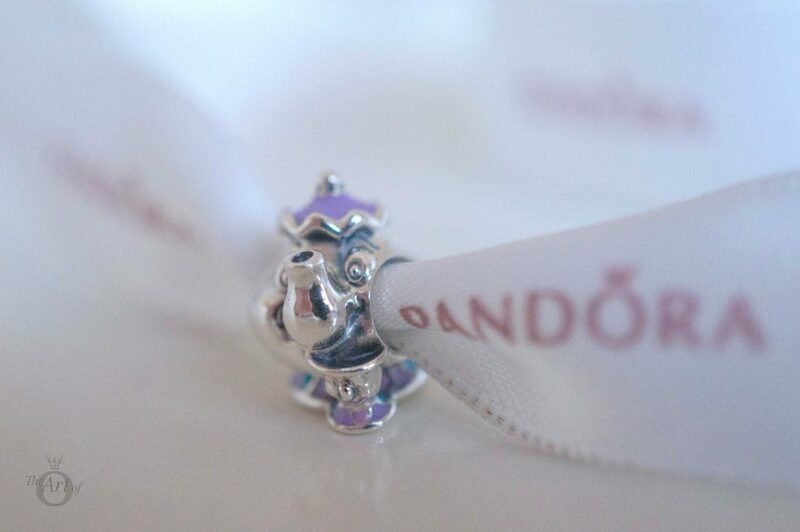 With the new version of Beauty & the Beast film released earlier this year, the Mrs Potts & Chip Charm was a must-have for many PANDORA and Disney fans. The PANDORA Disney representation of Mrs Potts is incredibly accurate to the original animated version of Beauty & the Beast. The shape of the tea pot is satisfyingly round and the frilly lid and upturned spout all add to the character of the kind, lovable Mrs Potts. The enamel detail is also a perfect match to the original animated version, with pretty pink, blue and purple shades. 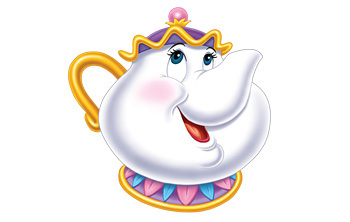 As soon as I saw the stock image of the Mrs Potts & Chip Charm, I fell in love with her friendly expression. Each time I look at the beaming smile of Mrs Potts I find myself smiling in return! 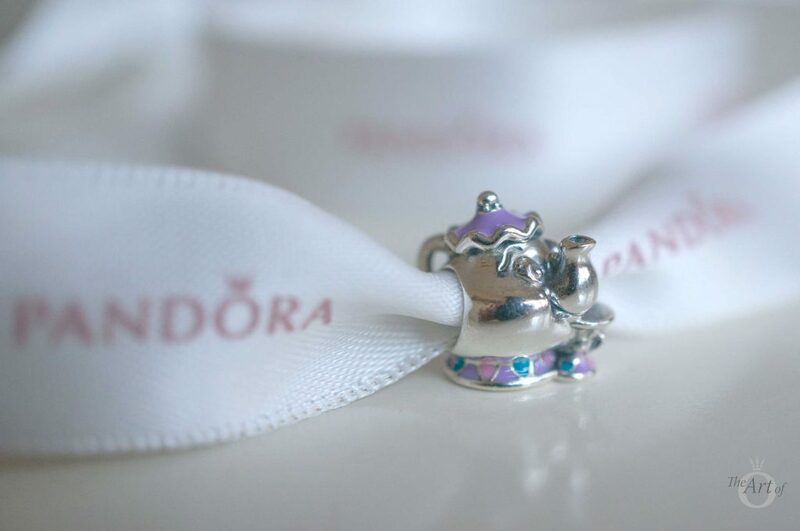 The Mrs Potts & Chip Charm is a threaded charm and feels quite heavy. 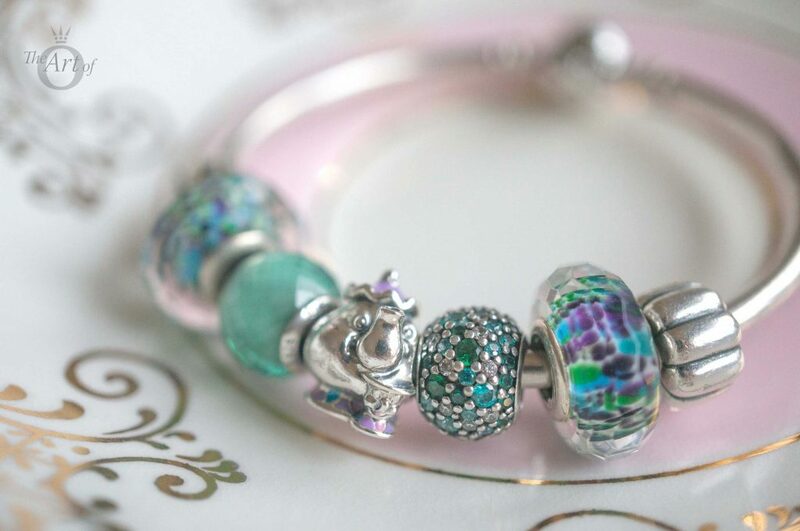 It is bigger than some of the other recent PANDORA Disney charms and is quite a lot larger than PANDORA Two Tone Teapot (No. 790250). 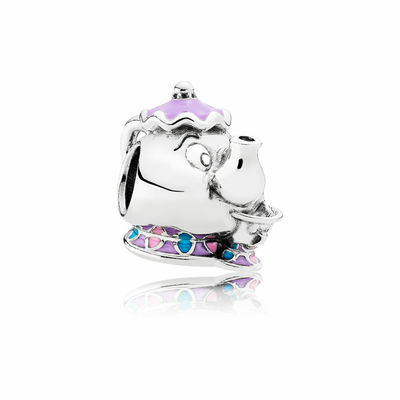 The Mrs Potts & Chip Charm has been designed so that Chip and the spout and handle sit at a diagonal. Personally, I find this angle more pleasing to the eye. 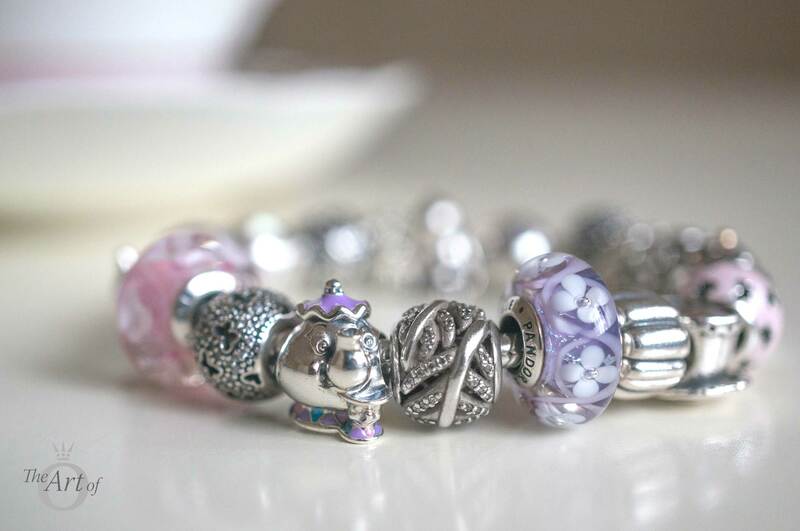 It adds quirkiness and character to the charm which is missing the simple PANDORA Teapot charm. It also means that the spout is less likely to snag on your clothes. Chip is nestled underneath Mrs Potts spout which makes for a nice snug design but does make it tricky to see his sweet face. The detail in the expression is amazing and you can see the boyish enthusiasm bursting out from Chip. The hallmarks are not overbearing on the Mrs Potts and Chip Charm. The Disney hallmark sits quite low at the back of the charm whilst the usual PANDORA hallmarks are discreetly hidden underneath. 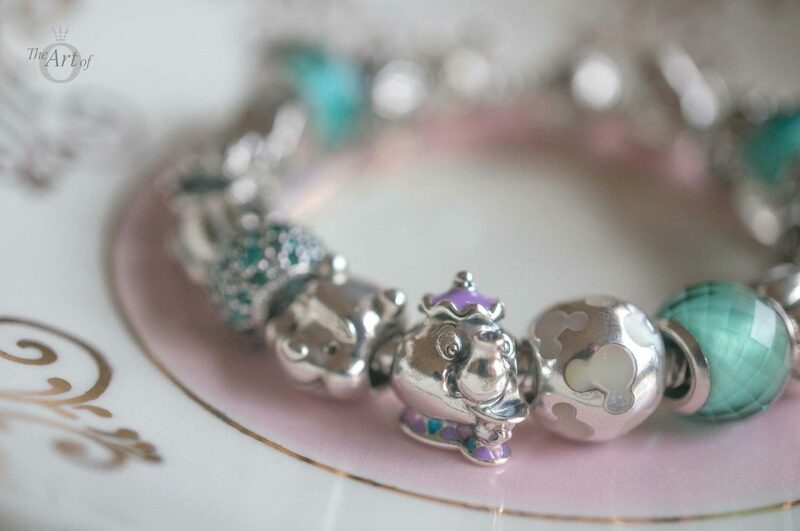 I love every detail about the Mrs Potts & Chip Charm, including the pretty enamel pastels. At first I wondered if a plain silver charm would have been better but now I think it is just perfect as it is. Many Beauty & the Beast fans may choose to wear the Mrs Potts & Chip Charm along with Belle’s Dress and Signature Colour Murano Charms, however I have chosen less obvious themes for my designs. 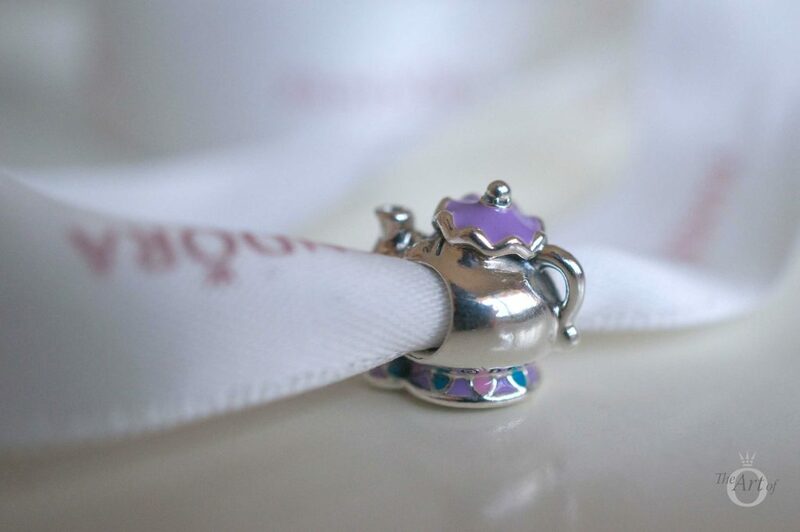 First, I went for a Disney Tea Party theme, using the Teacup, Teapot and Cupcake Charms. I emphasised the pretty colours on Mrs Potts with the Fluttering Butterflies Charm (No. 791483EN68), the Lavender Daisy Meadow Charm (No. 791487en66) and the Pink (No. 791665) and Purple Field of Flowers Murano Charms (No. 791665). 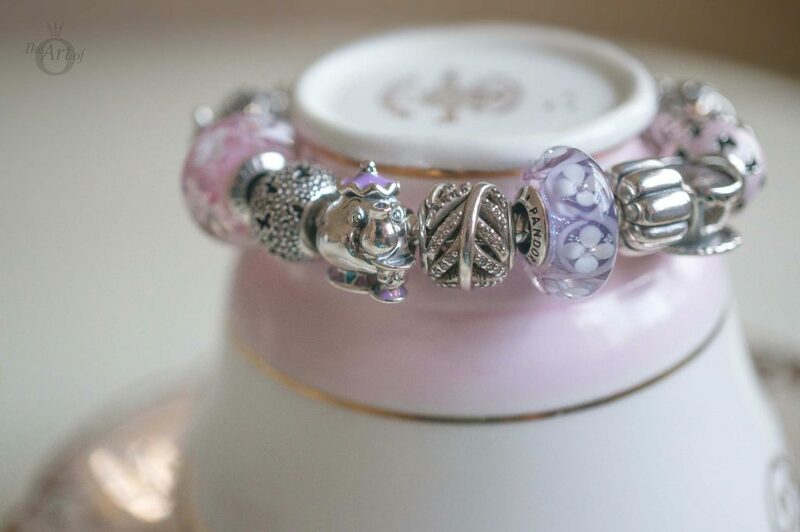 Read the review of the Pink and Purple Field of Flowers Murano for more styling options. 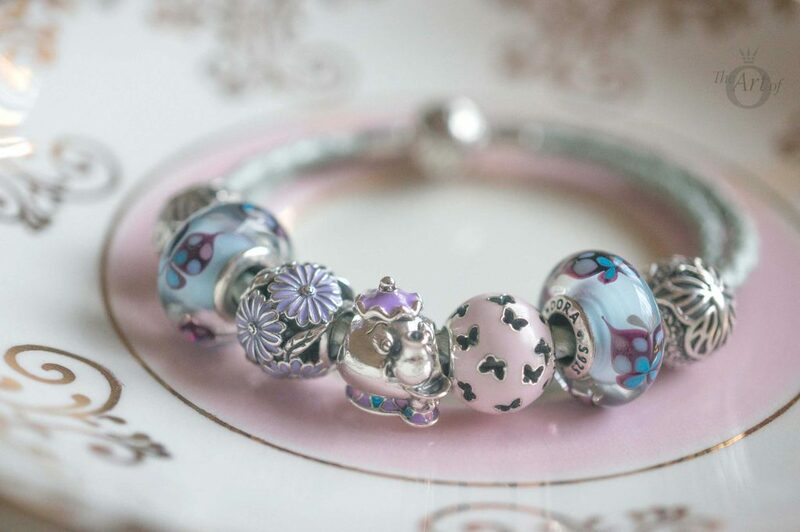 The PANDORA Disney Parks Alice in a Teacup charm (No. 792126enmx) would also look perfect in this design. I can’t wait for it’s release! 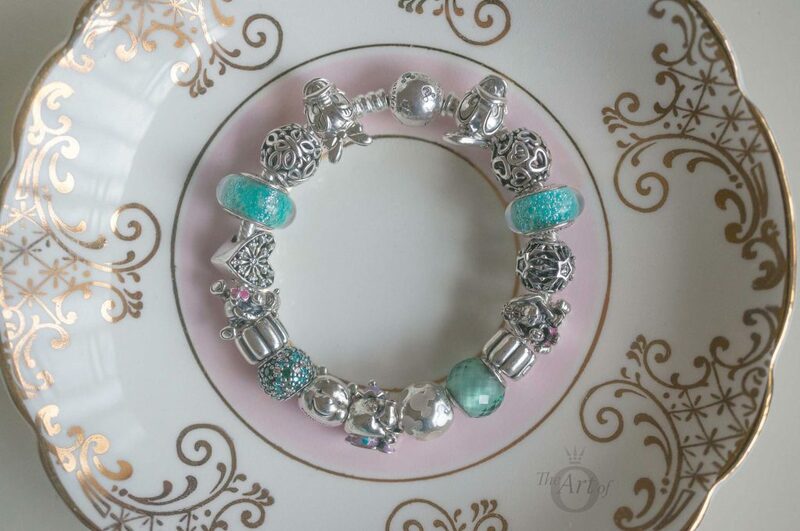 The Mrs Potts & Chip Charm looks fantastic as a feature bead and it my next design I styled it on the Light Blue Woven Leather Bracelet (No. 590734CBL-D) alongside the charming Blue Butterfly Kisses Murano Charms (No. 791622) and Lacewing Butterfly Clips (No. 791256). I love this combination of colours and think it is a darling design for the warmer months. In my third design I had a little fun and created a Disney theme in pinks, teals and green on the Disney Mickey Silhouette Bracelet (No. 590512CZ). 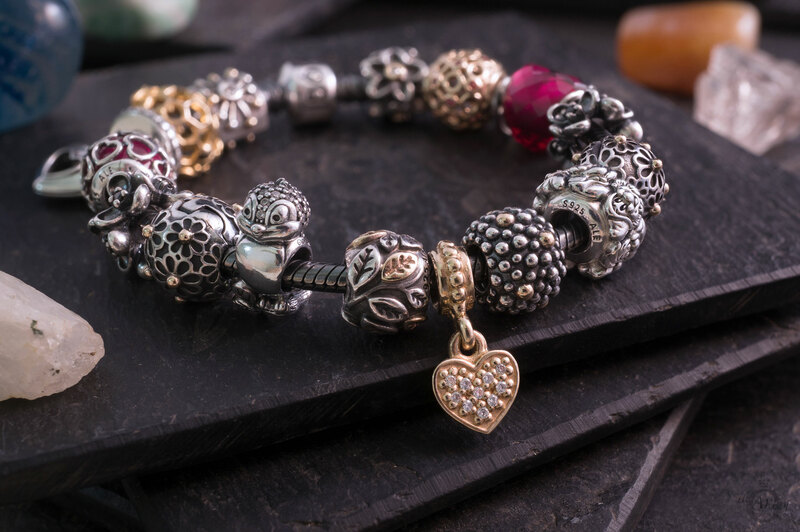 The Jasmine’s Signature Colour Murano Charms (No. 791648) add a dash of sparkle and the Disney Frozen Snowflake (No. 791563CZ) and Heart of Winter Charm (No. 791996CZ) add some Disney magic. Finally, using the PANDORA Bangle I created a mini-design full of colour. The purple and blue shades in the Shoreline Sea Glass Murano (No. 791608) highlight the enamel detail on Mrs Potts & Chip beautifully. I love the vibrance in this design and I’m sure I will be wearing it a lot this Summer. My verdict on the Mrs Potts & Chip Charm? Just my cup of tea! 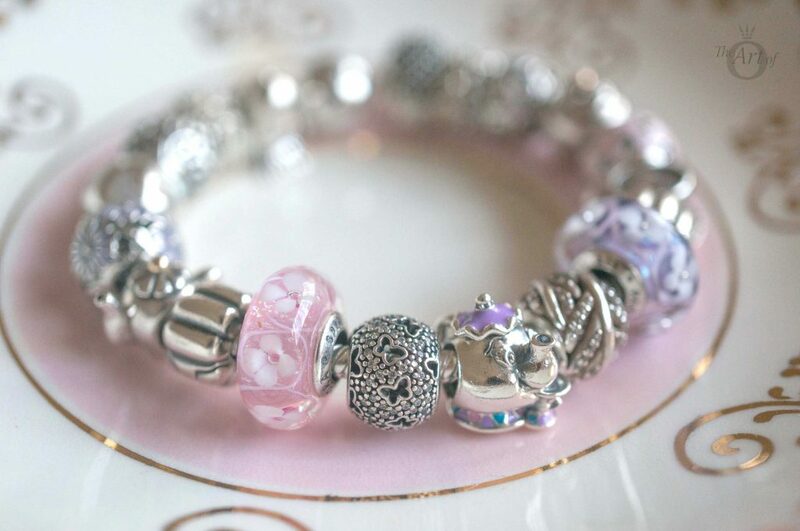 The PANDORA Disney Mrs Potts & Chip Charm (No. 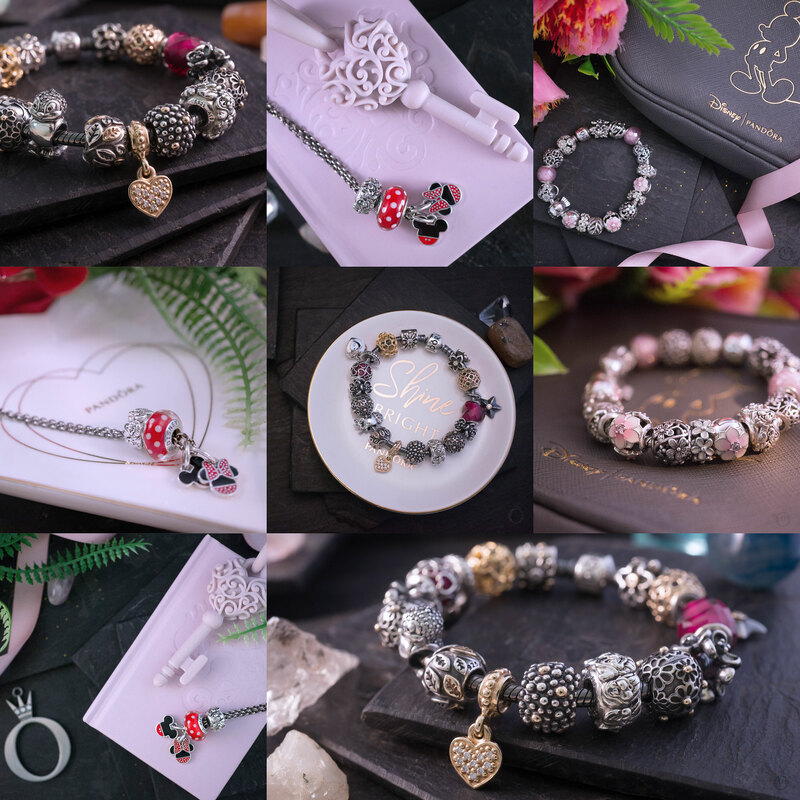 792141ENMX) is $50 US / $55 CAD / $69 AUS / £45 / €49 and is available from our preferred retailer BeCharming.com along with the rest of the PANDORA Disney Spring 2017 Collection. 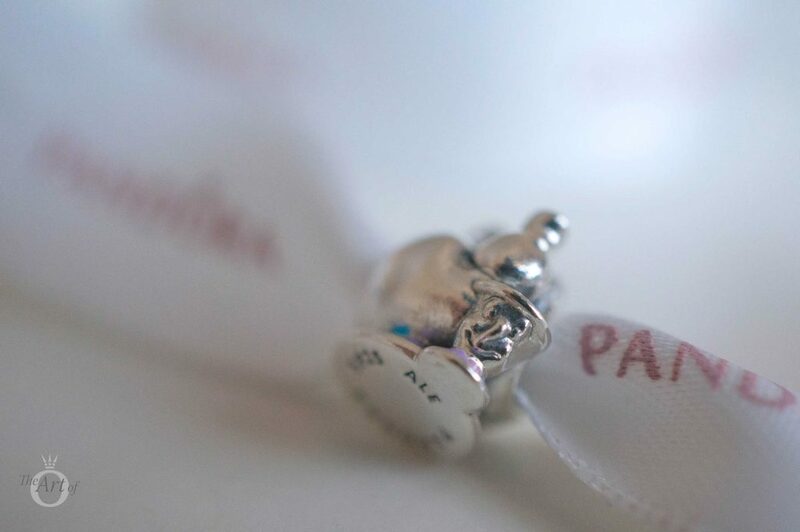 Have you bought the PANDORA Disney Mrs Potts & Chip Charm or is it on your wishlist? How do you style it? Let us know in the comments below. So excited to have won Mrs Potts. Now I need some friends to go with her on my Beauty and the Beast bangle, which will probably become a Disney bangle. That’s fantastic that you won Mrs Potts & Chip! Well done! She is really cute isn’t she? Are you going to try to collect all of the Beauty and the Beast charms? 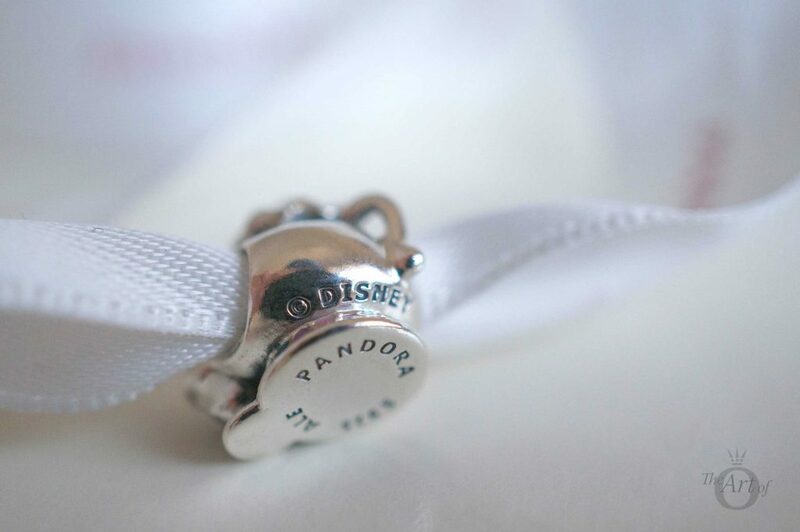 What other charms from the film would you like to see produced by PANDORA? I have Pooh, and I’m waiting for Dumbo and Alice in the teacup to arrive from US. So it’s going to be a Disney bracelet rather than just. Beauty and the beast. When I get some of Poohs friends, I’ll change things around. Hi Dora, your designs are gorgeous, Mrs. Potts is in my wish list, B&B is my favorite story, so I’m making a special bracelet inspired in it, in the spend and save promotion I bought the B&B limited edition bangle with the help of a friend who traveled to US, so my design is going to have a new “home” and there is a special place for this beautiful charm. Thanks for share this amazing post!! That’s great you were able to get the limited edition bangle! Did you get the special sleeve too? What other Beauty and the Beast charms are on your list? Remember if you want to get Disney charms quicker you could use mail forwarding companies like a Shop & Ship or Borderlinx. Then you could also take part in some more of the awesome promotions they have in the US. They are quite reasonable price wise and I’ve never had any problems with import duty even I’ve used them.